Explore, Learn, Have Fun! 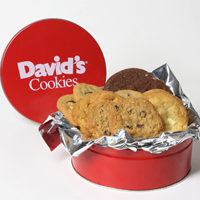 : Get $25 worth of David's Cookies for only $2 ~ Little Birdie rocks! Get $25 worth of David's Cookies for only $2 ~ Little Birdie rocks! Today's national deal is a $25 voucher for David's Cookies, for $12. YUM. But remember that $10 credit? You can get this deal for $2!! Seriously! They have cookies, brownies, cookie dough and more. A 1 lb tin of cookies is $24.95 - shipping is $4.95. I bought the voucher from Little Birdie and paid $2 after my $10 credit. I'm registered with Shop At Home, which gives you a cash rebate for shopping online (7.5% with David's Cookies!) so I'll spend about $7 total out of pocket, but if they use my total amount ($24.95 & $4.95) spent, I think I'll get about $2.00 back, so it will be a total of $5 for a dozen freshly made cookies delivered to our door. Sweet! (Click the box below to sign up for Shop at Home - they partner with thousands of stores & websites to give you cash back for online shopping!) Wouldn't fresh cookies make a great Father's Day gift? Or a sweet surprise for someone you love?